"We had put the oars and boats away one last time and before we loaded ourselves into the car, we silently took one last look over the dock and placid lake. I didn’t want to leave; I didn’t want this sculling camp to end. That’s how I felt when my wife and I attended a Calm Waters Rowing session in November 2018, and it truly changed our rowing lives. 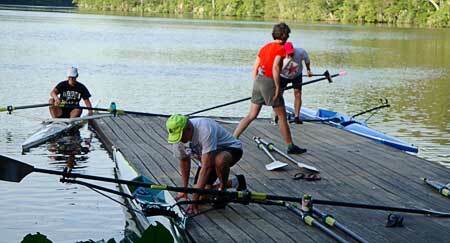 Our only regret is that we hadn’t attended Calm Waters Rowing sooner. It’s hard to convey the thoughts that fully capture this incredible experience. John and Charlotte have created a relaxed, supportive and focused atmosphere that is very conducive to learning. 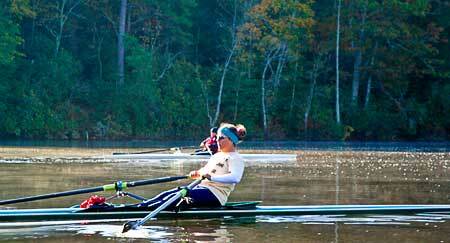 Three sessions on the water per day allow prompt practice of each topic, thus quickly building skill levels. They clearly communicate their observations with suggested improvements, always delivered with a healthy dose of encouragement. John and Charlotte give students the knowledge and confidence to move up in boat speed / instability, if desired. The small group sizes mean lots of individual attention: on the water, on the dock, and during video sessions. Their insightful observation and expert coaching enabled me to row a racing single for the first time in my life, and to row it comfortably. 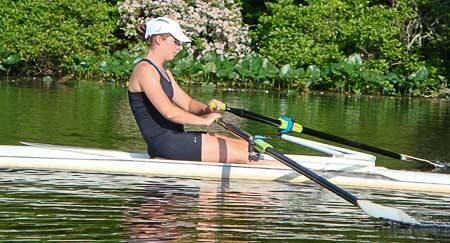 This camp has tremendously increased my confidence as a sculler. Thank you John and Charlotte! John and Charlotte teach the sculling technique practiced by the top scullers worldwide. It is a natural style, smooth and fast. The proof of this technique’s success is shown by numerous Olympic and World Class scullers, as well as by Charlotte’s string of victories at major regattas. 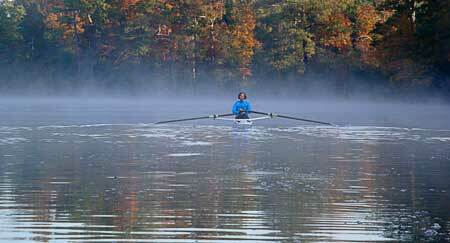 The camp setting is ideal for sculling and has to be experienced to be fully appreciated. Calm Waters Rowing has its own lake; no one else is on the water except the scullers attending camp. The lake is more than big enough for long straight runs, tall trees surrounding the entire lake block the wind, and it is common to spot bald eagles flying overhead. It is truly idyllic. In addition to the fantastic rowing venue, John and Charlotte are your gracious hosts in their welcoming Inn, and the gourmet food is an additional plus." "Awesome! Love the inn, fabulous lake. Best time rowing ever!" "Thanks for helping me undo all my bad habits." "Visit #6 – just fabulous as usual. Great weather, water, coaching – fun!!" 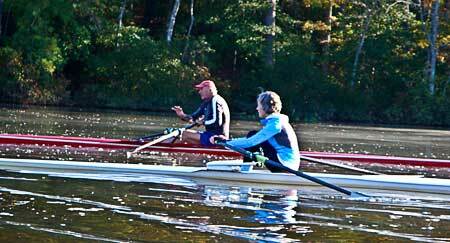 "Thanks for starting my sculling career at age 50." "You make learning so much fun. I'm amazed at my improvement." "Thanks for making a sculler out of me." "Two coaches who really know how to coach...what a magnificent experience!!" "Came looking for transformation and found it! Thank you both!" "Thanks for a great intro to rowing! Your enthusiasm is contagious!" "Excellent coaching in a kind, non-intimidating way." "Came to make my husband happy...left loving it!" "I loved learning to row, but this experience was so much more." "Very effective coaching style. I learned so much." "The best! Thanks for the confidence!" "CWR was all I had hoped for and more. Great place, great instruction, and great people. Thanks!"